They say multimedia journalism is the way forward; hell, it is the way forward. 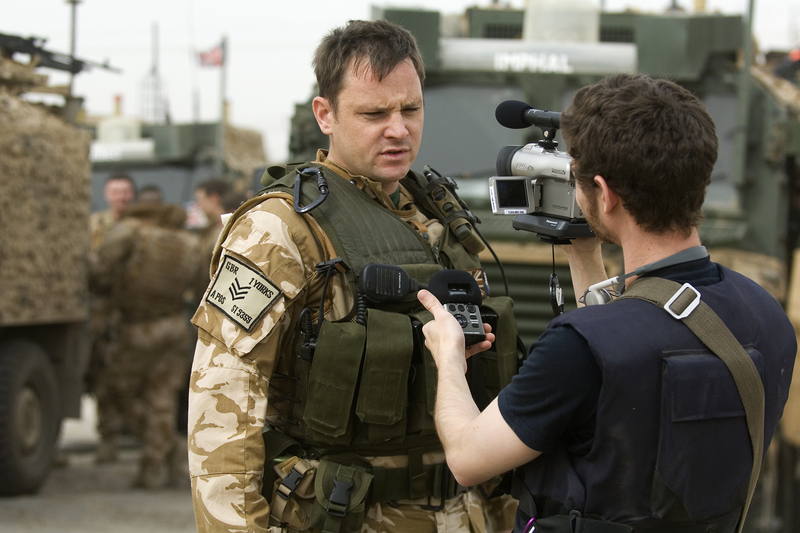 But sitting on a moving helicopter, flying over the rooftops of Baghdad, camera in hand trying to get a shot out the side, while also checking your audio recorder is working, with your seatbelt barely fastened….well it’s not easy. That was the challenge I faced during my week with the First Batallion the Yorkshire Regiment in Iraq. On assignment for my employer – a radio station – I was also armed with a DV Camera and digital camera, hoping, desperately to come back with high quality video, audio and pictures. Now the obvious question, looking at the picture (right) is why didn’t I just use the audio from my video pictures? A good question, but I felt seeing as my primary reason for going out to Iraq was for radio, I needed to make good rich quality audio my priority. I just didn’t trust the quality from my DV Cam. I think though, in future projects, perhaps not just for radio, I will use onboard audio. But juggling equipment isn’t the only problem for a multimedia shooter, I learned. The big challenge is juggling content. It might be easy to say ‘just take a camera out and use the on board mic for sound and freezeframes for images’ but that ignores the fact that all three mediums – audio, video, pictures – have their own methods and priorities. Your video demands clean white balanced shots and considered visual sequences of something happening. Your audio demands to have clear sounds of that something happening. And your pictures want to be well framed and capture a split second, not a moving image. Voice overs or pieces to camera have to be written differently for video than audio as they demand different styles. The former is written as a slave to pictures, while the latter must cope without any pictures at all. So, in short, it’s a bit of a mindfuck. But then if it’s not worth having, it’s not easy to get, right? So how should the journalist approach multimedia stories? 08. and don’t just think in terms of audio, video or still images..what about interactive timelines, potted histories and discussion boards? If your final platform is online then all these are options you can bear in mind. All I will say is it was a lot more challenging than I had anticipated-if anyone has any other practical tips then please, add them below! A friend from college in the 80’s, who started off at Channel Island news was killed in a helicopter covering that Afghan War. You have brought back memories. Great piece. I do find a more superior batch of content comes from using a team though and this maybe because although I work with multi media.. My ‘multi’ maybe too ‘multi’. Along with Stills, HD video and audio, I also like to (where possible) live stream, micro blog (twitter) and gps tag as i go. I find so much more value in logging the live progress as ‘news’ to preempt the final edit. This not only raises awareness of the project as it is happening but opens up all sorts of real time resources as connections are made as you document. I dream of working in a team with a snapper (maybe me), a videographer and an audio guy. All of us able to live blog out project and do stuff to camera. On a trip into Jordan for the UNHCR I had limited time so I ditched the video camera and just worked with stills and audio. During the live blogging of the project I was contacted by Bill Cammack who ended up editing the final piece into a film. I think I may now blog about this.. even if just to keep my comment short. you have inspired.. good work.. great blog.. Thanks. Good post. I linked via documentally and interested in both your takes on this. I worked as a producer/director in kids tv for a long time and I guess I was an early adopter – using dial-up on compuserve in the mid-90’s to bounce scripts back to my Exec Producer from around the world and using the early DV cams in the late 90’s to shoot in Japan and Vietnam. But the wave of stuff over the last 6 years is just amazing and great what you guys can do. Not sure you’re right about the script being different for radio and tv. I’ve heard radio reports on BBCR4 that worked really well and then been surprised to see the exact same report on the BBC1 news with pictures. They just took the audio straight for the radio news. Worked fine. There are some really good tips here. I especially think that planning the final product is super important for all multimedia journalists. Usually journalists just turn up and go with it but if you are trying to create an excellent project that early planning can make a massive difference to the final product. It could really be the difference between someone producing a great story, or someone coming back with barely enough footage to cut.